Even the strong cool winds that reminded us winter had not yet left didn’t deter buyers or sellers at the latest Winnipeg Livestock Auction sheep and goat sale April 3. More than 250 animals went through the ring and goats were strongly featured in the sale. Buyers seeking goat kids found an excellent choice and some other classes of goats were found to be in short supply, though buyers did have the opportunity to bid in all classes. In the sheep sale the ewes showed up in fashions ranging from early sheared to bearing a full fleece. Two groups of wool ewes likely found lower prices due to their obvious lack of a clean environment. The three groups of sheared ewes appeared to fetch a higher price from buyers, but that could also be due to their lower weight compared to some of the other groups of ewes. A 120-pound Suffolk shearling brought $205.40 ($1.675/lb.). Overall the bidding was strong, continuing the trend observed at the last sales. The demand for the rams was sure apparent from the strong bidding. 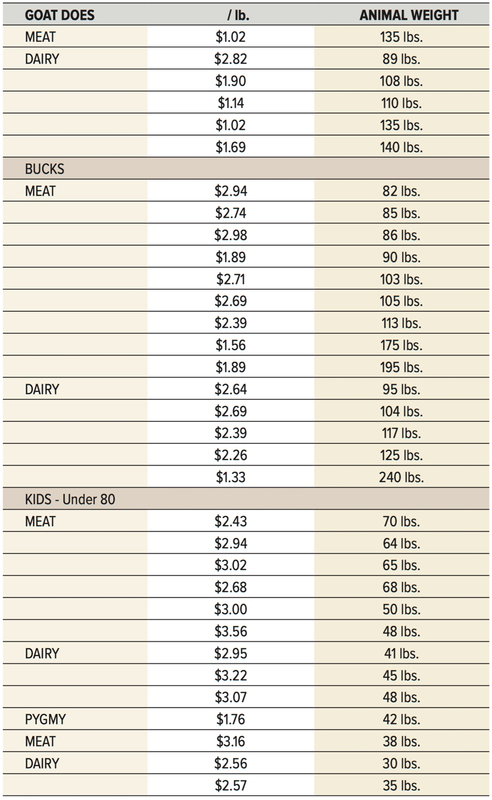 The average price bidding was from $1.18 to $1.35/lb. There were the exceptions of a 205-pound Suffolk-cross ram and a 205-pound Rideau-cross ram, both which brought $1.41/lb. There was very limited selection of market lambs, which spark some differences in bidding. Local buyers with immediate use of the animals in mind appeared to drive higher prices in some cases. A 105-pound Suffolk-cross lamb brought $2.45/lb. A 100-pound Rideau-cross lamb brought $2.05/lb. Five 109-pound Suffolk-cross lambs brought $2.09/lb. The feeder lambs saw some exciting bidding as the buyers were looking forward to the Easter season. The selection was limited, the quality of the lambs was good — so buyers were interested. The higher price bidding ranged from $2.80 to $2.96/lb. The lower price bidding ranged from $2.56 to $2.57/lb. An exception were two 83-pound exotic/fancy lambs that brought $2.97/lb. There was a major price difference between wool and hair lambs, with the lighter-weight class. Five 72-pound hair lambs brought $2.55/lb. The two 78-pound wool lambs brought $2.86/lb. Eight much lighter lambs did not maintain the price bidding at this sale. It was possibly too early for those local individuals wanting a smaller lamb for Easter. 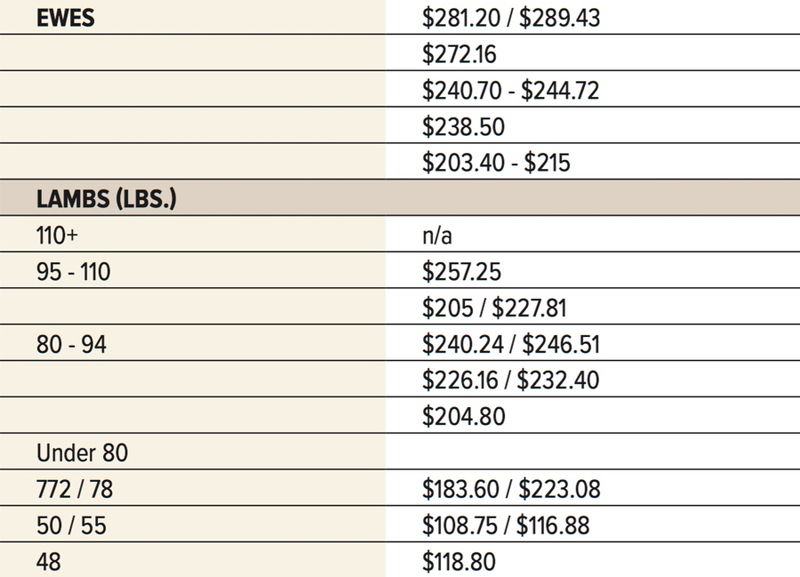 A 55-pound Rideau-cross lamb brought $2.125/lb., while an exotic/fancy-cross lamb brought $2.175/lb. and three 48-pound Dorper-cross lambs brought $2.475/lb. There were no clear indications that new-crop lambs were delivered or entered into the arena. Turning to the goat sale, once again the younger goat does were of serious interest, possibly for increasing a herd. There were culls, quite noticeable, which caused the lower bidding. The dairy-cross goat does were represented by the Alpine breed. The breeding season has been completed and the goat bucks were given the opportunity to regain the loss weight. Thus, an opportunity to sell the goat bucks. Next season, a new bloodline will be used to improve the herd. The spotted goats have never lost the interest of the buyers. A 105-pound spotted Boer-cross buck brought $2.69/lb. There were numerous wethers included in this buck class, which based upon the weight could not be included in the goat kid class. Many of the goat kids were very short and plump, some indication that some Pygmy bloodline was in the breeding. Also, viewing the wool, there appeared to be some evidence that Angora was in the breeding. Even with these factors, there appeared to be negative issues in the bidding. The bidding for the goat kids seemed to return to the 2018 usual price bidding. The demand or interest for goat kids have remained strong, possibly due to the Easter season. Some of the Angora-cross goat kids could become part of the wool industry. Diversity on the farm might be returning. The Ontario Stockyard Report had concluded that all lambs had major interest and sold high. The heavier sheep had difficulties securing sale.